One could easily wonder if Brooks had ever set foot in any supermarket before. He soon segued into waxing rhapsodic over Orthodox Jews — who are apparently the only people he can conceive of having a need or desire to shop at a kosher supermarket. This is where I, a kosher-keeping, Sabbath-synagogue-going, sukkah-building Conservative Jew, started getting a little angry. I have heard of these laws. In fact, I observe them. I was educated by my Conservative Jewish parents, and at my Conservative synagogue. I went to Jewish summer camps and summer study programs in Israel. The Jewish calendar governs my life, from Rosh Hashanah all the way through the year. I realize that I am a minority, but I exist. And my Jewish observance is just as legitimate as Orthodoxy. It also infuses my everyday reality no less than theirs. My Jewish observance, though, is one in which values of egalitarianism exist. It is one in which I am seen as an equal, countable member of the congregation. It is one in which I can read Torah to a mixed audience and can teach my daughters how to read Torah. It is one in which my voice is not only allowed to be heard, but also actually matters, beyond the perimeters of my own home. Pieces like Brooks’s column, however, make it seem as though one cannot have a meaningful, multifaceted Jewish life outside Orthodoxy. I believe that my family and others like mine are living proof that it is possible to live a highly Jewish life, with community and kavana in a non-Orthodox context. It’s certainly more prevalent in Orthodoxy, but I don’t like the tone of Brooks’s piece, which sets up an either-or proposition. As it is, I’m already worried enough about the potential demise of my chosen Jewish path. Because it all boils down to numbers. I’ve had four kids so far, but try as I might, I can’t single-handedly repopulate non-Orthodox Judaism. I fear that when my children grow up, they will encounter a world in which they will have to choose to be Orthodox or secular, and that no other options will exist — that while Conservative and Reform Jews were busy building gorgeous edifices of synagogues, they will have neglected to build communities that ensure their survival. I long for someone to stand up in Conservative and Reform synagogues and say, “Hey — if we want our egalitarian models of Judaism to have a fighting chance in the future, we need to think out of the box. “We need to put our money where our mouths are when it comes to ensuring a Jewish future. We need to make sure our young congregants are on JDate. We need to make sure to reach out to and include Jewish singles and young families as much as we do senior citizens. Five years ago I interviewed Arnold Eisen, chancellor of the Jewish Theological Seminary, for a feature article timed to his assuming leadership of the seminary. When we discussed the dwindling numbers in Conservative Judaism, Eisen pointed out that an increase in the “quality” of involved congregants could compensate for the decline in quantity. In other words, the glass may well be half-empty, but what’s left in the glass is top-shelf champagne. I think we should aim for our cups to be full instead. 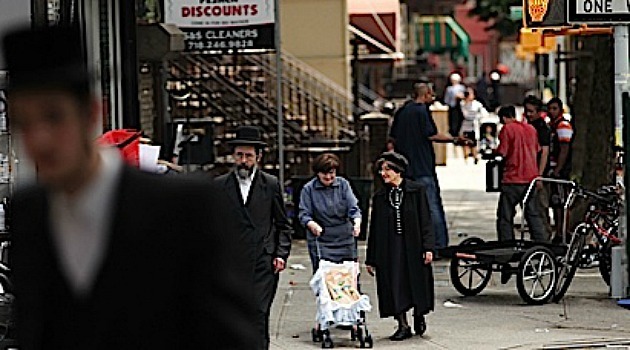 I hope Orthodox Jews are the future, but that they are only part of a larger future in which American Judaism has many different vibrant, living movements and traditions, not just one. Jordana Horn is the former New York bureau chief of The Jerusalem Post and is a contributing editor to the parenting website Kveller.com.